It is my pleasure to introduce Dr. Jordan Belislie from Southern Missouri University who is one of the most infectious and enthusiastic researchers in the field of behavior analysis, relational training, and autism. In this warm and positive blog, Jordan hopes to inspire future researchers to take up the challenge of furthering the development of the PEAK training system and behavioral relational training research more generally to help children with autism – Dr. Ian Tyndall, University of Chichester, UK. In 2012, I was attending a provincial conference in Ontario, Canada, and completing my final year of undergraduate studies in the coolest behavioral psychology bachelor’s program in the world. 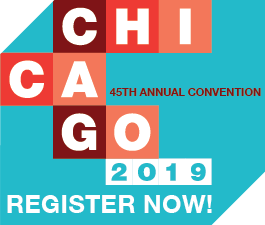 This conference was a big deal for me because I was searching for ABA graduate programs in the states and was becoming really upset about my search. I wanted to become a great practitioner but was upset about the lack of complexity in how ABA was being applied to autism treatment. I also wanted to become a great scientist, but I was upset about how some of the really exciting topics that I had been exposed to in undergrad weren’t being frequently researched in applied settings. Although, basic research is very exciting! At some point this research has to lead to real-world change, but where was this happening, especially in terms of autism treatment? Fate isn’t real, but sometimes really timely things happen! 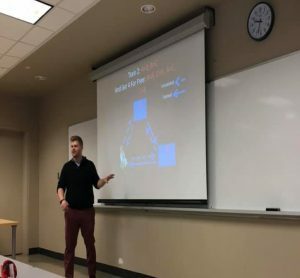 Mark Dixon (the guy who wrote PEAK) was an invited presenter at the conference and talked about how his research lab was applying Relational Frame Theory (RFT) in gambling treatment. One thing that I really appreciate about Mark is that he always talks about his work as “his lab’s work,” giving credit to all of the students that he mentors and turns into top-notch scientist practitioners. This was the kind of stuff that I wanted to do! I asked Mark after his talk if he had heard of anything applying RFT in language training with kids with autism. And, he told me about this mega-project that his lab was working on called PEAK! Like many who has heard Mark talk about PEAK, I was instantly sold! So, I packed my bags and moved to Southern Illinois to work with Mark and his lab. Four modules, eight assessments, and over 40 publications later (and many, many sleepless nights), this project has turned into a revolution in autism language training that I never could have imagined ever being a part of. I am going to share the top 5 experiences during this project over the past 6 years. This is the anecdotal experience of one PEAK-geek, and I hope that sharing these experiences inspires fellow PEAK-geeks in their role within what seems to be becoming an autism treatment (r)evolution! In my second year of graduate school, I was given the chance to oversee a group of students at a very large school specialized for children with autism. For those of you who follow research on PEAK closely, you’ll often see “the study took place at a specialized school for children with autism.” This is because lot of the early research on PEAK came out of this place. One of the graduate students that I worked closely with was a first year student named Caleb Stanley, whose name you’ll also see on almost all of the early PEAK research. For months, Caleb and I conducted more assessments than most people will conduct in a lifetime. We were curious about how language develops in children with disabilities, from early echoics through complex forms of relational responding. We also wanted to know how PEAK was related to other assessments that were trying to measure this same general thing. One of our first data sets compared PEAK assessment scores with scores on the VB-MAPP (Verbal Behavior Milestones Assessment and Placement Program). The school had been using the VB-MAPP for a while but wanted something that went past 48-months for many of their students. After running several analyses of the data, Caleb and I were so excited that we decided to go to Denny’s that night, have a few cups of (cheap, graduate-student quality) coffee, and start writing our results. By 8am the next day, we left Denny’s and had completed a draft of the manuscript that the lab submitted for publication that week! The paper was accepted with few revisions and was one of the first published studies on PEAK at that time. It was also the first of many papers that came out of Caleb and I working together at the school, where Mark’s lab is still conducting research on PEAK to this day. We had no idea how big PEAK would become while pulling an all-nighter at a coffee shop, as the first module had only recently been published. We were just excited to see how PEAK worked and how it stacked up against the VB-MAPP empirically. Also, we were very excited to tell the school that they could use an assessment that (empirically) went past 48-months! The earliest research on PEAK focused a lot on the psychometric properties of the assessments, and we submitted this work to journals oriented to this type of research. At the same time, publishing research in Journal of Applied Behavior Analysis (JABA) is a really big deal to anyone who does research in ABA! Peer-reviewers at JABA demand very tight procedures that ensure outcomes are caused by the treatments in place. As science should be! However, very few RFT-based studies were appearing in JABA that used these more comprehensive strategies to teach new language skills. After we had been running PEAK with the students at the specialized school for some time, we saw the students doing some really amazing and complex things. They were showing new responses that we had never reinforced before! Could we design a well-controlled single-case experiment that was JABA quality to capture some of the really amazing things that we were seeing these students learn? One of the first studies looked at early perspective taking. We wanted to see if we could teach the students to take the perspective of other people in a really foundational way. For example, if you were me, what would you see? [the right answer is the keyboard!]. Not only could the students do this with the pictures that we trained, but they could also do this with new pictures, and they could reverse perspective, all without being directly reinforced! We submitted this paper to JABA, and after a number of revisions, the paper appeared in JABA in 2016. I was very proud of this paper and my first publication in JABA will always be memorable. Since then, we have continued to submit much of our work to JABA, where you will see our research on teaching participants to tact emotions of others metaphorically, establishing more complex academic skills, changing scores on the VB-MAPP, among other verbal behaviors that we were able to teach that will be coming out in the near future. I am just as proud of the work that we have published in other journals, but there is something special about seeing research on PEAK in JABA because of the role that the journal has played in the evolution of our field. Like any scientist-practitioner in our field, doing only one thing is a really good way to find yourself unemployed. At the specialized school where we were doing a lot of this early PEAK research, we were also responsible for conducting functional behavioral assessments of challenging behavior. And, we were usually pretty good at it! Current ‘best-practice’ approaches in ABA provide a pretty good – and somewhat simple model to follow. Step 1) determine the consequences maintaining challenging behavior. Step 2) develop a differential reinforcement procedure that staff can implement. Step 3) implement, track data, and adjust. In most cases, this was very effective (as now decades of research on the Early Functional Abilities (EFA) scale suggests it ought to be). However, there was a specific group of students where isolating a specific consequence seemed almost impossible. For students who were less severely impacted and were highly verbal, programming antecedent and consequential manipulations very rarely worked. More often than not, the team would suggest referring these specific students to work with other professionals such as psychologists and social workers to solve problems that were more “psychological…,” whatever that meant. Like any good scientist practitioner in our field, we consulted the available literature, and found very few research articles that specifically addressed challenges experienced by this group. EFA research largely addresses things like self-injury or stereotypy that are far less common within this group. So, how do we address the high rates of anxiety, depression, suicidal ideation, and oppositional defiance that we were seeing? At this same time, I was researching “rule-governed behavior,” which seemed to suggest that once language develops challenges may not be maintained by immediate consequences! To see if this was true with this group, we conducted the PEAK Equivalence Pre-Assessment with the students to see who could derive relations (any relations). We also had staff complete a QABF (blind) as a brief indirect assessment of the immediate consequences maintaining challenging behavior. Somewhat surprisingly (but not surprising in retrospect), we found that students who could derive relations were less likely to exhibit a single consequential function endorsed in the QABF! This result aligned with what would be expected given Skinner’s work on rule-governed behavior and suggested to us that new treatment models may be needed that directly address verbal rules of clients that are less severely impacted. We have begun experimenting with some of these models with initial success, which may have some major implications for what ABA looks like for people once verbal behavior develops! In May 2018, I graduated with my PhD, and Megan Miller asked if I was interested in doing workshops disseminating PEAK all over the world! If anyone has been following the evolution of PEAK, things really got huge when Megan got involved in this project. Her ability to disseminate and translate best-practice treatment models to behavior analysts and non-behavior analysts is second to none. So, like any reasonable scientist, I agreed to conduct these workshops as disseminating science is something that I value. My first full workshop took place in Brooklyn, NY! And, I was terrified. I was used to conducting 30-minute talks at various conferences, but 12 hours of talking about PEAK is another story. The people in the audience really got me through it. Several of them had been using PEAK and struggling to figure out exactly how to fit PEAK into their individual workplace. These weren’t people worried about the theoretical coherence of RFT with Skinner’s account of language *eye roll*. These were people who wanted to start making meaningful gains in true language with the clients they worked with every single day. This was exactly our struggle in the early days of researching PEAK at the specialized school! I have been able to provide some solutions to attendees, but I have been incredibly impressed with how people who attend the workshops have already begun to solve a number of these challenges in innovative ways! In Washington, DC, some incredible BCBAs developed a very sophisticated tracking system and are using rates of skill acquisition to determine level mastery within programs. In Kingston, ON, a research group has begun conducting their own independent research on several aspects of the PEAK curriculum. I feel like after each and every workshop, I am coming home with new ideas for research and practice and am inspired by the levels of PEAK-geekery that I have observed. I think all of us who do these workshops would say the same thing! I very recently started my first professor job at Missouri State University. At the time of writing this, I have completed all of one semester as a professor. Everything I read in preparation for this position said to ease into a new professor position. Naturally, I have chosen to ignore this advice and have built the HUB research lab with the immense support I have received from fellow faculty at MSU. HUB stands for “Humans Understanding Behavior.” After one semester, our lab has procured local grant funding for autism research, including a PEAK research grant that will support the development of a very teched-out therapy room on campus to conduct tightly controlled research on PEAK and other autism treatment technologies. 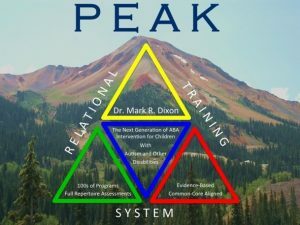 We are going to research novel approaches to staff training, further explore properties of PEAK and other assessments, and see how much PEAK can lead to gains in derived responding and intelligence! 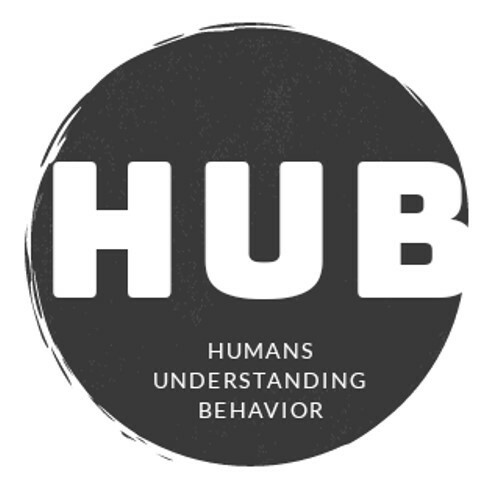 HUB currently has 8 volunteer undergraduate and graduate students interested in learning all about applied behavior science. My goal is to provide them with the same opportunities that I had working with Mark and his lab, as I truly believe the best way to learn something is to do it… and to do it a lot! A major theme of our basic and applied research is on how complex systems “self-organize,” borrowing from major advances in physics, biology, and even in artificial intelligence! Mark and I have a paper coming out in Perspectives on Behavior Science in 2019 that describes how self-organization may be apparent in equivalence-classes consistent with equations borrowed from classical mechanics. We call this Relational Density Theory. Ultimately, we are trying to capture how training can lead to verbal behavior that is resistant or flexible – and allows for even faster acquisition of new verbal behavior with and without reinforcement. My lab has since produced basic experimental research with college student participants showing self-organization across experimental phases, and we have some preliminary data showing that this likely occurs with children with autism who can derive relations. These self-organizational models will be a major component of HUB’s research on PEAK and other technologies and much of our applied research moving forward. 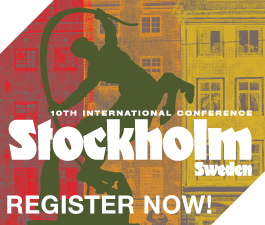 We are also trying to establish strong connections with agencies throughout North America to build and support a small and committed network of scientist-practitioners interested in researching language acquisition in children! The last several years have been incredible! And I have had the privilege of watching PEAK grow from our early research to what it is has become today. So many people have been involved in this movement, and these are my top 5 experiences as one of those people. Each of us has a story to tell, and there will be many more stories as PEAK continues to grow! 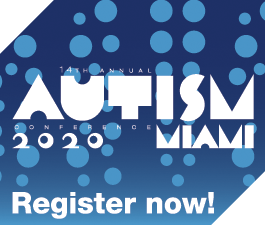 This journey was never about PEAK; rather, it was about infusing advances in behavior science within autism treatment. Experimentation, data analysis, and peer-review are staples of our discipline, and the experiences I have shared hopefully represent a shift to this as a necessity rather than a luxury within our language assessment and training models. Only through adherence to the scientific method can (r)evolutions occur in our field, ultimately for the benefit of the clients that we serve!